Check in again for more love and laughter as new arrival Richard Gere joins an all-star ensemble cast - including Judi Dench, Maggie Smith, Bill Nighy and Dev Patel - returning for this heartwarming sequel to The Best Exotic Marigold Hotel! Now that his first venture has been proven successful, ever-confident Sonny (Patel) is busy juggling plans for a second resort...as well as his own wedding. But his efforts are constantly hampered by hilarious complications, and in order to pull it all together, he’ll need a little help and encouragement from his resident friends. The 'The Second Best Exotic Marigold Hotel' competition has now closed. Winners will be announced shortly. Competition opens at 5pm AEST on Sunday 19th July 2015 and closes at 11:59pm AEST on Sunday 26th July 2015. Five winners will be chosen at random on Monday 27th July 2015. To successfully win, entrants must fulfil the above entry conditions before the time the competition closes. Current members/followers are eligible to enter the competition. Only one entry per person. Only one winner per household. To be a valid winner, the entrant must not have won a prize from SWITCH within the last 28 days. 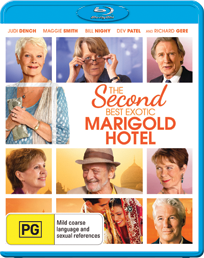 Each winner will receive one Blu-ray copy of 'The Second Best Exotic Marigold Hotel'. By entering, you agree to receive occasional emails from SWITCH in the future. If you decide to unsubscribe from these updates, any further entries will not be applicable. Only Australian residents are eligible to enter. Own the hilarious 'The Second Best Exotic Marigold Hotel' on Blu-ray and DVD on Wednesday the 22nd July 2015, or click here to buy now on Digital HD.